If you’ve wondered about whether you may be at risk for diabetes, pregnancy can be a crystal ball, allowing you to see what may be in your future. Type 2 diabetes—the most common form of diabetes—occurs when your body can’t properly manage blood sugar. Your body uses the hormone insulin to move sugars (glucose) from your bloodstream into your cells, where it’s used for energy. Insulin acts like a key, unlocking cellular walls to let sugar inside. If your body doesn’t produce enough insulin, or if you cells can’t use insulin efficiently (called insulin resistance), you’ll be left with too much blood sugar circulating in your body. Although many women with type 2 diabetes develop it after they’ve had their children, some develop it before they’re done with childbearing. If you have type 2 diabetes before pregnancy, talk to your health care provider before you’re pregnant to be sure your blood sugars are in good control. 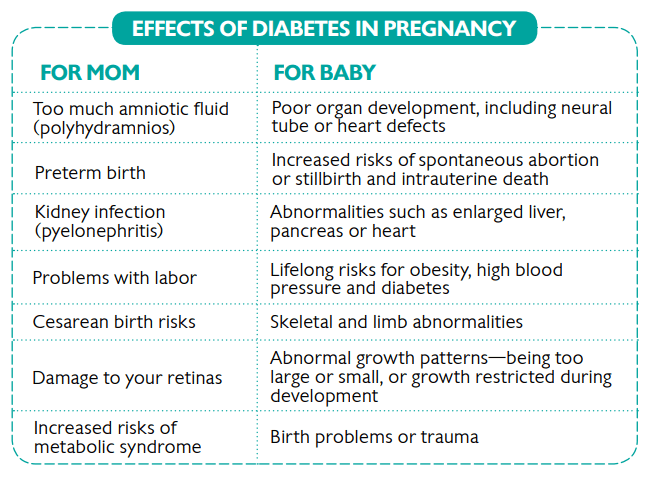 High blood sugars in the first 2 months of pregnancy put your baby at an increased risk for birth defects. Be sure any medications you may take will be safe during pregnancy. Use a reliable form of contraception until you have good blood sugar control. If you need insulin during pregnancy, you’re more likely to develop type 2 diabetes within 5 years. When diabetes develops during pregnancy (usually diagnosed in the last 3 months) it’s called gestational diabetes. 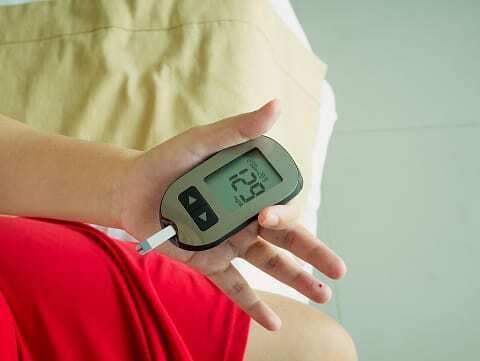 If you have gestational diabetes, your body can’t increase insulin production, leaving higher levels of blood sugars than normal in your bloodstream. Some women can keep their blood sugars normal by changing their diets and increasing their physical activity. Others need medications, either pills or insulin injections, to keep blood sugar normal. If you need these during pregnancy, you’re at increased risk to develop type 2 diabetes within 5 years, research demonstrates. Prevent diabetes by avoiding the unhealthy habits that increase insulin resistance in your body, including being overweight or obese, eating an unhealthy diet and avoiding exercise. Work with your nurses to adopt healthy lifestyle habits that will keep you on track to avoid diabetes in pregnancy and throughout your life.